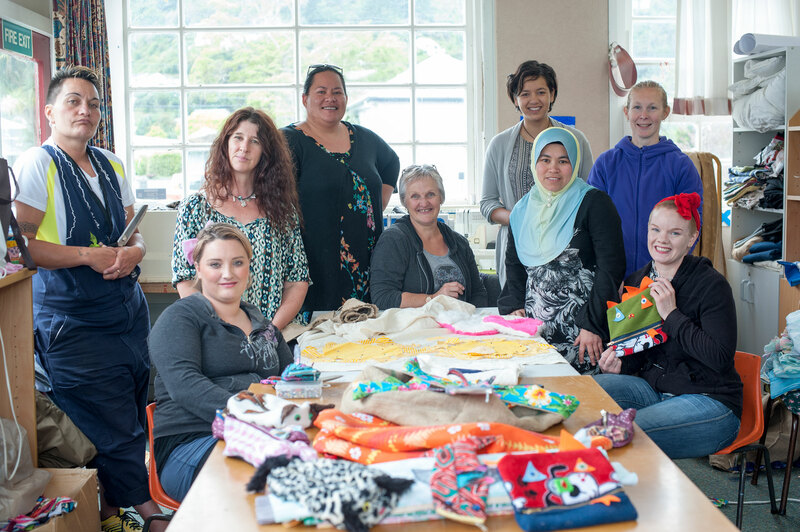 These are the Mum’s from The The Common Unity Project Aotearoa Sew Good Cooperative at Epuni School in Lower Hutt. Of all the stories B-Side Stories has done, this one is possibly the most powerful, Why? Because their story is a community led response to the economic and social pressures facing a huge percentage of our country. These women are doing it for themselves. After founder Julia Milne has taken a few awards this year as the Overall Winner at the Wellington Airport Community Awards and the Sustainable Champion at the NZI Sustainable Business Awards for her work and vision on the project, we thought we’d go and have a chat with the Mums to see what the best things about the year were for them…..and it wasn’t what we thought. If you think these women were doing an awesome thing please vote here as they are in the running for a grant that will really help their Koha Kitchen come to life.Closes Dec 11 so please do it today. It takes two clicks. This entry was posted in Enterprise, Social & Civic and tagged Community Gardens, Cycling, Education, Family, Food, Garden, Human Rights, Lower Hutt, Permaculture, Sustainability, Volunteers, Welly Women by lauriestarfish. Bookmark the permalink.